Tragedy strikes the lives of some of Israel’s greatest leaders in this week’s parashah. Moshe and Aharon are denied entry into Eretz Yisrael and soon afterward Aharon dies on top of Mount Hor. It is recorded that “entire community saw that Aharon was dead” and “they mourned Aharon thirty days, the whole house of Israel.” Although the people had often contended with Aharon, they felt a sudden sense of loss at his passing. How sad that our people didn’t realise Aharon’s greatness until he was no longer with them! Indeed, this realisation must have added to their pain. But if the people suffered in their grief we can be sure that Moshe suffered a great deal more. We can scarcely imagine the pain and turmoil which Moshe felt at being parted from his beloved brother. The fact that his death came swiftly after that of his sister Miryam must have made Moshe’s pain all the more acute. For as we read, “The people of Israel, the whole community, entered the Tzin Desert in the first month, and they stayed in Kadesh. There Miryan died, and there she was buried.” It’s easy to overlook this simple pasuk in a parashah so full of tragedy but that would be a mistake. Miryam was a formidable woman in her own right and Moshe had no doubt relied upon her prophetic guidance as he led our people through the desert just as much as he had upon his brother. Now that she was gone Moshe found himself suddenly bereft of her wisdom. But there were further repercussions that resulted from her death. 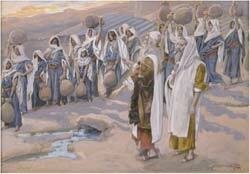 Indeed, it is no coincidence that following her death the Torah records that “the community had no water”. This teaches us that the water which had satiated our people’s thirst and kept them alive in the desert had flowed on account of Miryam’s merit. Such was her stature as a leader! Indeed, the sages further note in this respect that Miryam’s death is juxtaposed with the regulations pertaining to the Parah Adumah (Red Cow), whose ashes were used to produce purifying water see this page. Just as the offerings bring atonement and life to the nation so does the death of the righteous. We see this principle demonstrated on many other occasions in the Scriptures. At the incident at Ba’al Peor, for instance, Hashem commanded Moshe to “Take all the chiefs of the people, and hang them facing the sun before ADONAI, so that the raging fury of ADONAI will turn away from Isra’el.” In fact the plague which had begun to rage in Israel on account of the people’s sins was only halted by Pinchas’ swift action when he impaled Zimri. In Shmuel Alef 21 we similarly read of how a three year drought in Israel was ended by King David when he had the descendants of King Shaul impaled. “Thus,” explains the JPS Torah Commentary, “impalement before/to the Lord serves an expiatory function, specifically, to assuage the wrath of God, who had blighted the land with drought for the violation of His treaty oath.” If therefore the death of the righteous serves to bring life and atonement then, we must ask, how much more would the death, nay, the impalement of the righteous Mashiach, bring atonement for our people, and indeed for the whole world? What would his life be worth? As we have seen, this concept is thoroughly embedded in the Torah – it is thoroughly Jewish. Indeed, the prophet Yeshayahu foresaw the death by impalement of the Mashiach when he said: “In fact, it was our diseases he bore, our pains from which he suffered; yet we regarded him as punished, stricken and afflicted by God. But he was wounded because of our crimes, crushed because of our sins; the disciplining that makes us whole fell on him, and by his bruises we are healed. We all, like sheep, went astray; we turned, each one, to his own way; yet ADONAI laid on him the guilt of all of us.” (53:4-6). In the closing verse of Yeshayahu 53 Hashem promises, “Therefore I will assign him a share with the great, he will divide the spoil with the mighty, for having exposed himself to death and being counted among the sinners, while actually bearing the sin of many and interceding for the offenders.”” (53:12). This is what Mashiach Yeshua accomplished both for us and for the whole world when he was impaled on a stake two thousand years ago. The death of the righteous Mashiach atones for our sins and brings life to our nation.